Based upon the spring season arriving early over the past 5 years or so, in my wisdom I had decided to bring my forays forward a week or two, to try and meet the spring head on. The long hard winter and the distinctly chilly temperatures that followed and carried well into April, soon put the mockers on that and did nothing to diminish worries that my first spring foray on April 17th was to be hard going………..
During wet periods in March, Oyster mushrooms were fruiting on Hampstead Heath and on a heap of Scots Pine needles and debris, Melanoleuca cognata var. 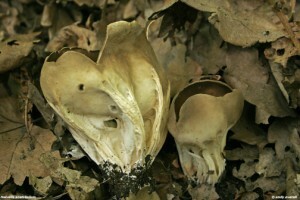 cognata, a typical spring mushroom, produced up 20 fruit bodies. So the signs were looking up for a good spring season. In previous years, St George’s Mushrooms had appeared by the end of March but despite fairly favorable weather, although with relatively low temperatures, there was no sign of any. On April 15th, I found one specimen, on a lawn upon Hampstead Heath. This was a sight for sore eyes. The first foray of 2010 on April 17th, started very slowly. The day was gorgeous, blue skies and warm sun of 18 degs, with no wind. Conditions had turned much drier but only superficially, as just below the surface it was still quite damp. Hornbeam, Willow, Hawthorn, Cherry were all either in leaf or just beginning, cherry was in flower. I find the spring to be the most wonderful season to be out and walking, especially with weather as wonderful as it was on this day. Ok, back to the mushrooms, an hour and a half into the walk, Coprinellus micaceus had been picked up, but apart from small bracket fungi and the Birch polypore very little else was showing itself. Eventually we came across a big old fallen beech tree, which provided some Oyster mushrooms and other records such as Pluteus chrysophaeus, Polyporus brumalis and Coprinellus lagopus. On that note we took a break in the rejuvenating warmth of the spring sunshine. The next segment of the foray was to be the shortest and the most rewarding. As we ambled along a small sandy track, one of the group found the first group of St George’s mushrooms, and then there were more and then more. The heat that we had been experiencing over the previous week or so had triggered the St George’s to fruit. The area in which they were found was also fairly damp and contained a lot of stingers and other small plants, among which the mushrooms were fruiting, the dampness and heat combined, were crucial to the fruiting. It was satisfying enough having found the St George’s but when one of the group brought to my attention, what they thought to be a Morel, I was ecstatic when I confirmed that it was indeed Mitrophora semiliberaone of the smaller Morels, which is very rarely recorded on the Heath, in fact this would be the first record of this species on the Heath. 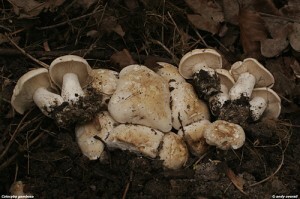 There were three or four specimens fruiting on sandy soil, path side among herbage and close to woodchips. 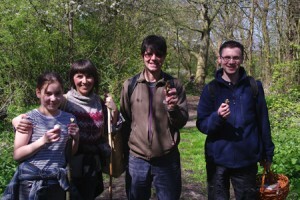 Further collections were made on 25TH April in a different location along the same track, close to an Ash tree, with which this species have been associated. 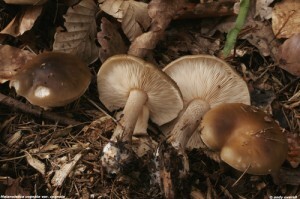 The distinct, darkening, vertical ribbing is a good characteristic of this species and the way in which the conical cap is attached to the stem, which is semi-free as the latin name suggests. This characteristic can be seen below with the sectioned specimen on the right as you view. 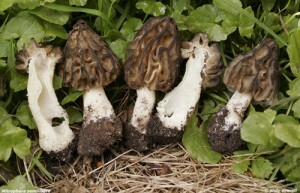 Morchella elata similarly hasthe black ribbing but the cap edge does not curve upwards but attaches directly to the stem. Despite the long winter and prolonged cold snap, warm spells with rain and now warm sunshine with drier conditions were enough to generate the growth of these fungi and make for a decent early spring foray and a good start to the fungi to be with forays 2010. 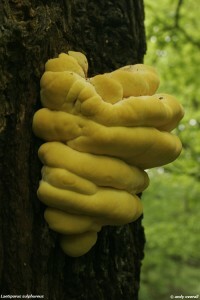 An early fruiting (May 6TH) of Laetiporus sulphureus (Chicken of the woods) is always a welcome sight. Here it can be seen in it’s early stages, before it begins to fan out and create distinct tiers. Helvella acetabulum, a spring ascomycete that is closely related to the Morels, is a rare species in the north west of London, it was therefore a big surprise to discover it flourishing on Hampstead Heath. It was fruiting in large numbers among almost identically colored old leaves, by a path side on a slightly inclined bank, surrounded by young elm and oak trees. I was of the impression that this species preferred alkaline soils but upon reading the neutral Ph of the soil in this area, it is obviously not a species tied to chalky soils. However, the soil where it was found is of a sandy nature and therefore free draining which could well be a requirement of this species. The distinct white ribbing that stretches like chewing gum, up the side of the cup, is characteristic of this species and helps distinguish it from other similar species of this genus. 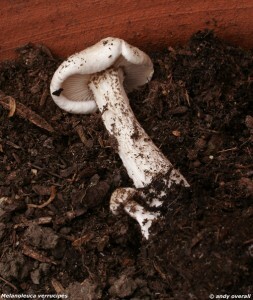 Melanoleuca verrucipes is another rarity and not just in north London but across the country. There are only 25 records of it so far. It is an introduced species that occurs on wood chip mulch and compost substrates. It has been recorded from nearby Highgate Woods during the early noughties but never from Hampstead Heath. This collection was found fruiting inside a large clay planting pot, full of compost, during early May. Initially I was wondering what this species was in the plant pot but when I turned it on its side and saw the red-brown scaling on the stem and the inflexed margin of the cap, I knew what I had. You just never know where and when some of these fungi will turn up. it was still fruiting in the pots on June 23rd. In fact this species turned up again during May-June in a totally different area of the heath. It was found fruiting on the same pile of Scots Pine chippings and debris as the Melanolueca cognata above, which was found during March this year. We are now at the end of November and seeing out what has been for fungi one of the most fruitful in recent years. This has been highlighted by a number of factors not least of course the wonderful array of fungi on display in our woodlands and parklands throughout the late summer and autumn months. Species populations and diversity seemed high throughout 2010 and this was relayed back from various other authorities throughout the country. Unfortunately this was all rather overshadowed during late October by negative articles in the press related to foraging and the effects of this activity on the eco-systems of particular sites in and around London. The level of publicity that this fungi abundance was afforded during 2010 was unprecedented. I had to laugh and curse with the same breath when the very same purveyors were during one month advocating the foraging of wild mushrooms, only to then castigate these ‘wild food perpetrators’ during another month. The problem with this kind of publicity is that people tend to hang onto the bad news end of the story, leading to the creation of an uneducated opinion, as most of the these articles do not present the truth about fungi and the way in which they work within the natural environment. 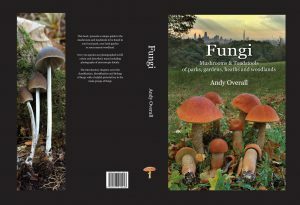 This then has a knock on effect to those who are educating people on fungi via hands on interaction with these organisms. I have experienced this first hand at sites that I have taken fungi walks for the past 15 years. Unfortunately we all get tarred with the same brush. Ok I have spent enough of my precious time on histrionic outcry I would rather remember the year for the highlights I think should be at the fore, such as the recording of Hericium erinaceus on Hampstead Heath for the first time, (Kenwood) and a new record for Epping Forest of Coprinus alopecia also recorded for the first time in a 100 years in the UK. Russula’s, Bolete’s and Amanita’s to name but a few were in abundance and variety. All this and seeing men, women and children of all ages having a good time among the green space we have to offer makes it all worthwhile for me, lets not let this be spoiled by a few narrow minded, mis-informed oafs.